Pildappa Rock is a unique pink inselberg located 15 kilometres northeast of Minnipa. Situated in South Australia's granite country, locals proudly proclaim Pildappa to rival the more famous "Wave Rock" - a sandstone wave form located in Hyden Western Australia. Formed about 1500 million years ago Pildappa Rock is part of the vast Gawler Craton - a geological shield structure covering central Eyre Peninsula, the Gawler Ranges and large parts of outback South Australia. 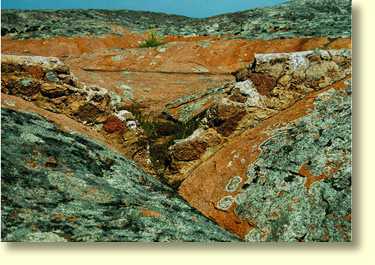 Geologists refer to Pildappa Rock and other inselbergs in the area as belonging to the Hiltaba suite of rocks - basically orthoclase rich pink granites dating from Eyre Peninsula's Precambrian age. Nearby the Gawler Ranges were formed as a result of volcanic action. 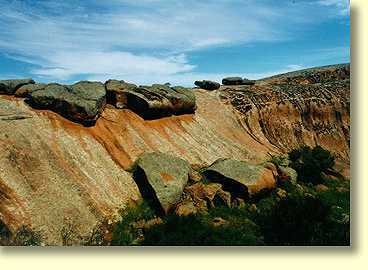 Unlike the Gawler Ranges however, Eyre Peninsula's inselbergs were formed as Batholiths or granite domes some 7 kilometres below the earth's surface. Clearly much soil erosion has occurred during the past 1500 million years. 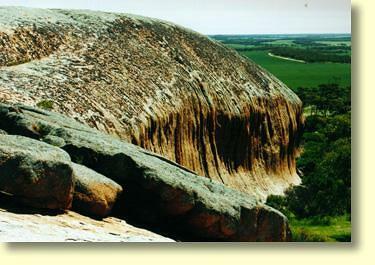 Equally remarkably, Pildappa Rock and many other Australian inselbergs exhibit very slow rates of weathering - with numerous studies indicating exposed granite surfaces eroding at rates below 50 centimetres per million years. 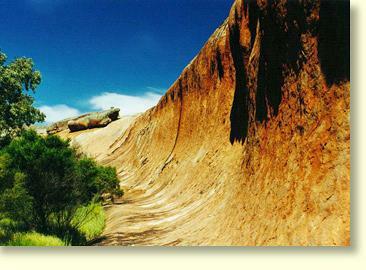 As an inselberg Pildappa Rock's outstanding feature is a unique wave form or "flare" structure extending for perhaps 100 metres. In terms of height the flared structure is perhaps 2 to 3 storeys tall. In common with other inselbergs, Pildappa's flared slope is the product of complex chemical weathering below the surface. Geologists believe the process of flare formation typically involves water runoff seeping into the soil at the base of granite rock faces. Over time, water and permanently moist soil conditions act together to chemically weather away highly reactive granite minerals such as orthoclase and mica. All this can take place at depths of up to 30 metres below the surface. In the case of Pildappa Rock soil levels have also gradually eroded away thereby exposing the prominent flare structure that we can see today. 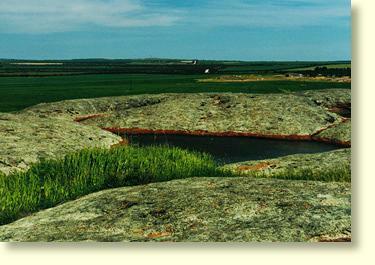 Elsewhere on Pildappa Rock other typical inselberg landforms can also be seen. 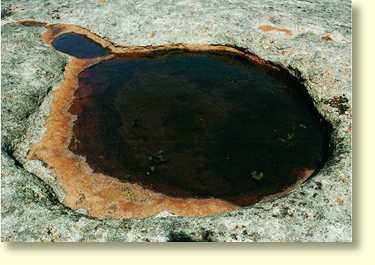 Decaying granite sheet structures, minor tafoni forms, and "water grooves" known as rillen can all be found. 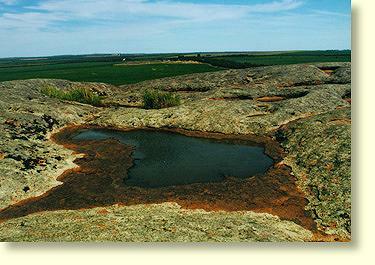 A must see for vistors to Pildappa are the numerous gnamma waterholes to be found at the top of the rock. Can you spot the old dam wall? Prior to European settlement gnamma rockholes were the only permanent source of water to be found in this part of Eyre Peninsula. For the local Kukatha tribe of aborigines such rockholes were an essential survival resource in a characteristically dry and arid environment. Early European settlers also recognised the value of such waterholes. At Pildappa pioneering farmers even constructed dam walls at the top of the rock in order to increase the rainfall catchment area of gnamma rockholes. Below Pildappa Rock visitors will also find an extensive system of man made gutters. 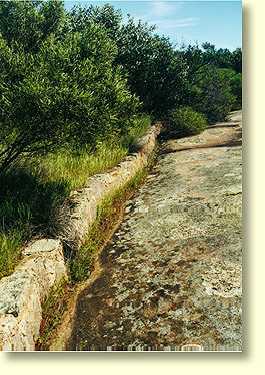 These gutters were constructed in 1928 and designed to channel water runoff into a huge underground water tank on the northern side of Pildappa Rock. 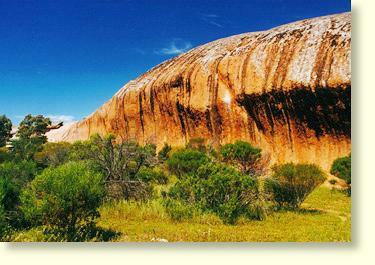 For travelers wishing to get off the beaten track Pildappa is definitely an excellent and accessible bush picnic site. Please note that the local council does not actually encourage camping at this site. At the base of Pildappa Rock travelers will find 2 free gas barbecues, rainwater tanks and ecologically friendly toilets. Nullarbor Net wishes to thank Le Hunte Council and the Minnipa Progress Association for making such facilities available to all travelers. If you haven't guessed by now, Nullarbor Net definitely recommends you pay a visit to Pildappa Rock - and don't forget to bring a roll of film! 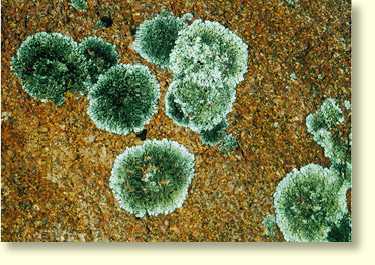 Nullarbor Net Tips: If you find Pildappa Rock to your liking try clicking on the links below to view Murphys Haystacks and Ucontitchie Hill.